Cullen Bunn: In many ways, "the world's smallest symbiote wreaking havoc" sounds about right, but that's really only scratching the surface of a much, much bigger and more... cosmic... story. This crossover's gonna have mass slaughter, super heroes beating the crap out of each other, prison breaks, freedom fighters, messiah figures, inter-dimensional travel, and an apocalypse that Venom and Scarlet Spider must stop. Chris Yost: This story breaks new ground for all three characters. Our guys - both hero and villain - are going to be meeting new characters, going places they've never gone before... it's going to be HUGE. Except in stature. It's going to be epic and somehow minuscule all at the same time. Cullen Bunn: Spidey's definitely sitting this one out, but there's definitely a significant supporting cast in the story. Katy Kiernan, a tabloid reporter who is joining Venom's supporting cast, plays a role in the tale, although she's not going to be happy about it. Cullen Bunn: Flash comes out of this story with a real fear of his own symbiote... And a real fear of what he could become. He sees how dangerous the symbiotes can be. Carnage is a nightmare, yes, but there's something more terrifying that haunts Flash after this adventure. He also sees the dangers of a killer instinct, both in Kaine and in Cletus. After this story, Flash wants to make some changes in his life... And his approach to being a hero. 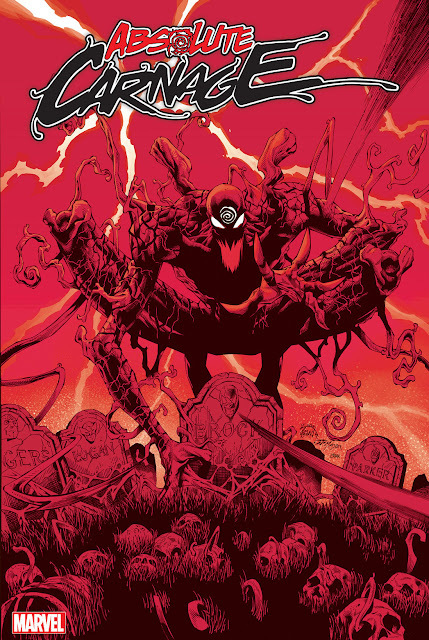 Cullen Bunn:...while the title is a nod to that event [Maximum Carnage], Minimum Carnage has little connection to that story line. No Shriek. No Demogoblin. This is a new tale exploring new ground for all the characters. Cullen Bunn: Cletus is still the symbiote. He's just starting to see things in a new light. And he's joining a group of new, murderous friends. Cullen Bunn: There are quite a few supporting characters in the story, some new, some existing. All of them will be somewhat unexpected. They aren't the typical characters you'd expect to join Venom or Scarlet Spider. In the end, though, this is very much the story of three players — Carnage, Venom, and Scarlet Spider. They won't be overshadowed by the supporting cast. With all of this talk, are you getting even more hyped for Minimum Carnage? No real new news, but Marvel has also just released an interview if you would like to check it out.